A Unique Value Proposition is a is a clear statement that describes the benefit of what you offer and how it helps your ideal customer. A Unique Value Proposition (UVP) can also be called a Unique Selling Proposition (USP) or a Customer Value Proposition (CVP). In some complicated markets, these three statements may vary slightly, but in general, they are the same. At Branding Compass, we prefer the term Unique Value Proposition. Why write a Unique Value Proposition? A Unique Value Proposition, or UVP, distills into one sentence the value of your product or service to your customers. While it seems so basic to be able to describe what you do and why it matters, many struggle with this. Have you ever been at a networking event or a party and had trouble quickly explaining why someone should buy your product or service? You probably know your business inside and out, but can’t always tell that story quickly. Your UVP should be a succinct statement, but it’s not meant to be catchy. 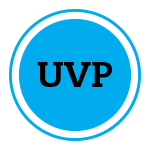 A UVP is not a tagline! However, once you are able to write your business’ Unique Value Proposition, you can then translate that into other uses. The writing content for your web site. On your home page, you probably use words and pictures to describe the benefits of your product and service. Your UVP can help guide you to write this copy. You may find your UVP a bit clunky, and a bit of a mouthful. It’s ok to break it into separate sentences and add a little more flair. Your networking introduction. How many times have you gone to a network event and been asked, “What do you do?” Having a clear UVP can help you to quickly answer this question. If it feels a little stiff, it’s OK to make the language feel a more natural when speaking. Your elevator speech. Your elevator speech is just a bit longer than an introduction and usually given in a situation when you are being asked more about your product or service. Take your UVP and fill in more details about how you work, how you deliver your service, or some of the key features of your product. Your brochure or flyer. If you are having a printed brochure or flyer created, make sure you’ve addresses all the key elements of your UVP. You may not use the complete UVP as a sentence. You may find that each piece of the UVP (for example: benefits, offerings, target market) are each separate paragraphs in your marketing piece. Your tagline. Your UVP may help you create a tagline. Taglines should be much shorter and much more memorable than a UVP. But any tagline you’re considering should be measured up against the UVP. Does the tagline bring to mind all the key traits you wish to promote? We know how hard it can be to write a UVP. It seems simple, right? But putting all the elements together can be challenging. Branding Compass helps you by taking your answers and automatically generating a Unique Value Proposition based on your words. You can then adjust the words or tweak the grammar, but the tool will give you a strong start. Tip: Go ahead and answer all the questions in Branding Compass with your best effort, but keep moving forward! Once you see the auto-generated UVP, it will be much easier for you to see how it all works together and can go back and refine your answers as necessary. For many business owners, reading the UVP that is auto-generated by Branding Compass can be a real “a ha” moment.